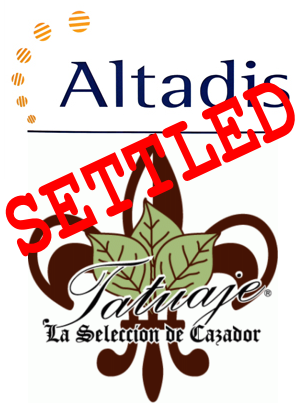 1) Inside the Industry: Late yesterday, a press release announced that Altadis and Tatuaje have “reached a mutually beneficial agreement resolving recent trademark disputes.” The two companies agreed to drop all pending lawsuits in a non-disclosed settlement. While it wasn’t clear from the initial statement, Altadis has since confirmed to StogieGuys.com that the settlement also includes all claims by Altadis against Don Pepin Garcia and his family company, My Family Cigars, Inc.
UPDATE: StogieGuys.com has confirmed that My Father Cigars will continue to hold the trademark on “Jose Pepin Garcia,” which was also at issue in the lawsuit. 2) A new study, conducted by the University of Georgia and the Centers for Disease Control and Prevention, claims outdoor secondhand smoke is a public health issue. “Secondhand smoke contains several known carcinogens and the current thinking is that there is no safe level of exposure,” said a study co-author. Such flawed “thinking” was examined in this 2007 commentary by George E.
3) Yesterday, the two largest universities in Kentucky became smoke-free. The University of Kentucky has banned all tobacco products on campus outright. Meanwhile, the University of Louisville is relegating smoking to certain “designated outside areas, with plans for a complete campus ban by next November.” While some doubt officials’ ability to implement the new policies, the intentions of these public institutions call into question the rights of adults to reasonably engage in an otherwise legal activity. 4) Around the Blogs: Stogie Review and the Tampa Cigar Examiner light up a Murcielago. Keepers of the Flame smokes a Cabaiguan Maduro. Cigar Inspector inspects the Ashton Cabinet Selection. Velvet Cigar torches an Oliva Serie V.
5) Deal of the Week: Cuban Crafters is having a Thanksgiving Special with some great deals, including a humidor box of Cubano Claros ($99), a box of 25 Cuban Crafters Cameroons ($74), and a box of La Carolinas ($59). Grab yours here. The fact that Altadis even filed lawsuits against Tatuaje (for using the very common Fleur de Lys symbol) and DPG (for actually having the temerity to use his last name as part of the name of his company) is ridiculous. They are the big guys with lots of cash and big-money lawyers so they took it upon themselves to harass the little guys who are actually making a splash in the cigar world. If Altadis was so concerned about Tatuajes using the brown and white labeling along with a fleur de lys, why did they not file this suit 5 years ago when Tatuaje first hit the market? Frivolous. Altadis should be punished for this spectacle. I say boycott…of course, that would assume anyone reading this blog actually purchases a lot of Altadis merch to begin with. Thousands of American motorists and pedestrians die every year due to automobile accidents. Is it even worth the risk to the nation? This is a public health issue. I say we band together and force Washington to criminalize the act of driving. No cars. No trucks. No deaths. If you’re worried about your kids or yourself inhaling secondhand smoke then don’t patronize private bars/restaurants that offer smoking accommodations—whether inside or outside. Even in locations without a government smoking ban, there are plenty of nonsmoking establishments available to choose from. The market has provided them because the demand exists. But once a prohibitive law is passed, all choice and freedom goes out the window. I love cigars and everything, but you can’t act like second hand smoke doesn’t do any detrimental damage to the lungs. Is it even worth the risk on the children? Life is the silent killer.